Scientific journals issued by the Faculty of Social Sciences are abstracted and indexed in world range databases. Ars Educandi is a scientific journal of Pedagogy at WNS UG. It is released every year and it raises issues important to social researchers. Our main interests are education, culture and society. The aim of Ars Educandi is to describe important topis and share results of researches - everything in the thought of pedagogy as an open cathegory, pulsing with different dialogues and dependences, filled with various discourses and matters. We are also open to new issues that appear along with social changes and improvement of technology - augment reality, game studies, gender studies, cybogisation, education in times of digitalised culture. Current Issues in Personality Psychology (CIPP) is an open access, peer-reviewed journal offering high quality articles within the field of personality, including the interdisciplinary perspective. CIPP publishes high quality original articles and reviews of recognized scientists that deal with personality theories and research from the perspective of social science, law and medicine. CIPP promotes the study and application of personality psychology to various domains of individual and social functioning. In particular we are interested in such topics as the role of personality in interpersonal relations; individual differences; personality disorders; personality development; personality and behavior dynamics; quality of life and well being; the interplay of culture and personality; biosocial bases of personality; and personality assessment and diagnosis. However, we are open to innovative research and new conceptual reviews in the field of personality science. CIPP is indexed in: EBSCO, ERIH PLUS, Emerging Sources Citation Index (ESCI), HINARI, Index Copernicus, J-Gate, Polish Medical Library (GBL), PsycINFO, ROAD Directory of Open Access scholarly Resources, WorldCat. Cywilizacja i Polityka/ Civilization and Politics is published by Division Science of Civilisation. The publication’s aim is to point scientific results regarding methodology/methodics of civilization and politics. European Journal of Transformation Studies (EJTS) is an open access and peer-reviewed biannual contenting articles from the area of social sciences and humanities. EJTS is dedicated to different dimensions of transformation (social, political, economic and cultural) as well as other aspects of social and political life such as global crisis, energy policy or importance of mass media in the current world and phenomenon of terrorism. EJTS is indexed in: Emerging Sources Citation Index (ESCI) , ERIH Plus, Index Copernicus and Electronic Journals Index University Library of Regensburg. Gdańskie Studia Międzynarodowe/ Gdansk International Studies is a scientific journal published by the Institute of Political Science of the University of Gdańsk. The journal has been published since 1998. The articles published in the magazine deal with various problems concerning international relations, political science, diplomacy, national security, global studies, geopolitics, geoeconomics and other related fields. The goal of authors publishing in Gdańsk International Studies is multidimensional, interdisciplinary explanation and analysis of complex processes occurring in the international environment. Health Psychology Report (HPR) is an open access, peer-reviewed journal offering high quality articles from the area of social and medical science. HPR is devoted to furthering the understanding of the psychological aspects of health and illness. HPR focuses on the publication in such topics as: psychological aspects of illness, treatment processes and recovery; psychosocial factors in the etiology of illnesses; health attitudes and behavior, including prevention and promotion; the individual-health care system interface, particularly communication, and psychologically-based interventions; child and adolescent health; couple and family relationships in health; lifespan approaches to health, including those related to older adults; quality of life and well-being; and research methodology, measurement, and statistics in health psychology. HPR is indexed in: EBSCO, Emerging Sources Citation Index (ESCI), ERIH PLUS, HINARI, Index Copernicus, J-Gate, Polish Medical Library (GBL), PsycINFO, ROAD Directory of Open Access scholarly Resources, WorldCat. Miscellanea Anthropologica et Sociologica, founded in 1992, publishes quarterly thematic issues on particular sociological and anthropological topics. It is edited by experts in the corresponding fields. Each issue, apart from being a collection of thematically consistent texts, includes a general section containing articles and reviews on various topics. Our effort is to combine theoretical discussions with empirical studies ranging from historical sociology to contemporary affairs and from social psychology to world cultures. Articles focused on the contribution to sociological theory are most welcome. Miscellanea Anthropologica et Sociologica is a reviewed journal. We publish articles in Polish and in English. All articles included in our journal (with the exception of licensed reprints) are granted a general free use permission for non-commercial activities. Niepełnosprawność – Dyskursy Pedagogiki Specjalnej/ Dissability – Discursus of Special Pedagogy aims to be up to date with issues covering special pedagogy and interdisciplinary views on disability issues. That is made possible as a result of transcending the realms of the discipline. We present practical solutions, results of empirical research and the current state of theory that altogether allow an interdisciplinary look at the issue of disability. All the articles in the journal are peer-reviewed. Problemy Wczesnej Edukacji/ Issues in Early Education – a peer-reviewed journal, was first published in 2005 under the patronage of Polish Pedagogical Association (ISSN 1734-1582; e-ISSN 2451-2230). Initially released as a semi-annual, the journal was turned into a quarterly in 2011, starting from the issue 2011/2(14). The periodical is addressed to academics, educationalists, teacher practitioners, students of social sciences and humanities, and other readers interested in the journal’s thematic content. The scientific and critical articles present for the most part issues related to research on the child, childhood, and early education. The intention of the editorial board is to return to a reflection on early education, going back to sources such as pedagogy, didactics, social pedagogy, the sociology of education, cultural anthropology, pedeutology, and psychology through publishing papers derived from these academic disciplines. Media Biznes Kultura/Media Business Culture is an academic journal of media studies profile, published by the Institute of Philosophy, Sociology and Journalism of the University of Gdańsk in partnership with the Media Ethics Team at the Polish Language Council of PAN (the Polish Academy of Sciences). 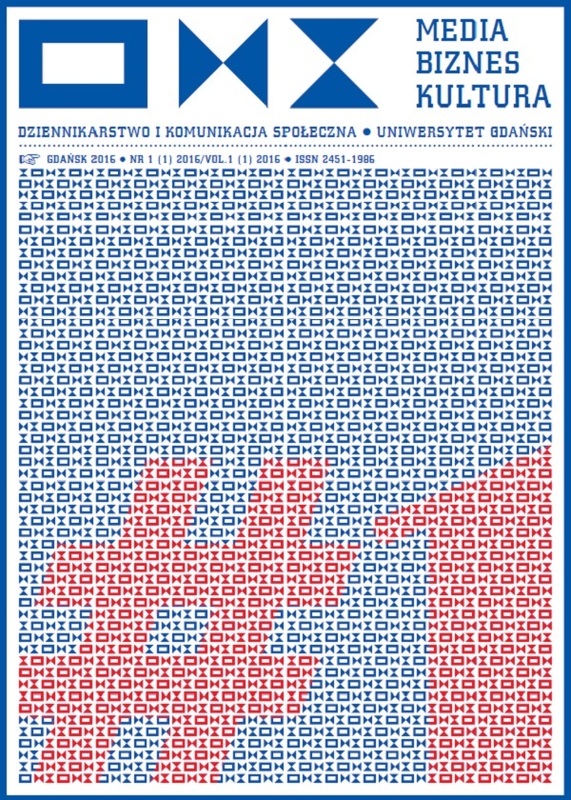 The title of the journal refers directly to the name of the international academic conference held periodically by Gdańsk’s journalism circles, to which event home and foreign scholars are invited, participating in an interdisciplinary discourse on the issues of media. The articles published here come from the border of various disciplines: media studies, communication sciences, marketing and management, psychology, linguistics and visual communication. The journal is bilingual, with papers presented in Polish and English.